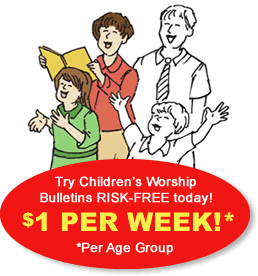 Children's Worship Bulletins are based on familiar Bible stories and Scripture passages. You'll find bulletins in our library for each of the significant themes and verses found in the Old Testament, the Gospels and the Epistles. Our Children's Worship Bulletins are educationally sound because each is reviewed by an educational professional. The teaching is clear, simple and faithful to the Scriptures. Each bulletin on the Children's Worship Bulletins website is jam-packed with 4 panels of games, puzzles, word searches, seek-and-finds, dot-to-dots and more activities that children love. Use them to create interactive and thought-provoking activities for your Sunday school class. To get you started, we've included two examples of Sunday school activities about Elijah in this short article. See how easy it is to create engaging Sunday school activities by using Children's Worship Bulletins! Give everyone a bulletin and a pair of scissors. Tell the class, "We're going to find out what Elijah and Elisha were by putting the letter puzzle pieces together. Carefully cut out the eight letter puzzle pieces from the top part of the bulletin page. Once you have the letter pieces cut out, assemble the puzzle to spell the word that describes what Elijah and Elisha were." After the children have put together their puzzles, read aloud 2 Kings 2:1-12 to confirm what both Elijah and Elisha were. Give each child a bulletin, a piece of blank paper and colored pencils or markers. Together as a class, solve "The underlined story words are incorrect ... " puzzle by replacing the underlined words with the correct rhyming words from the list at the top of the page. Compare the puzzle's answer to the Bible verses in 1 Kings 17:1-24. Ask the children, "Our story tells us that God gave Elijah very specific locations and directions from his home to the wilderness, brook and town. What are they?" Some of the answers might include Gilead, east, Cherith Brook facing the Jordan River and Zarephath near Sidon. Explain the activity to the class, "Use the locations and directions God provided in 1 Kings 17:1-24 to create a map of Elijah's activities in this story. Using the colored pencils or markers, draw a map on your piece of paper. Be sure to include all of the locations from our story." When done, allow the children to display their maps for everyone to see.